October 9, 2001 Seems every NC Seafood Festival weekend a wild and wicked mullet blow storms through and reminds everybody that it’s fall. But at least the weather is cool and crisp for optimum work on Cherokee. 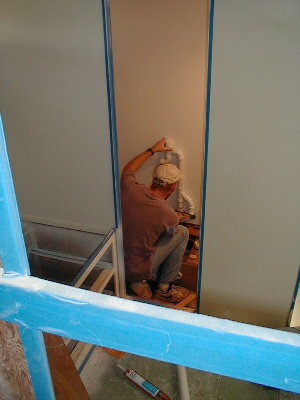 It’s perfect for painting, especially since some of the crew fashioned a dust-free paint room within the webboat facility. Bill Brown is painting the engines white, and Bud is painting the oil pans and cupplings white. Leonard and Bill Davis are fiberglassing the bumper. 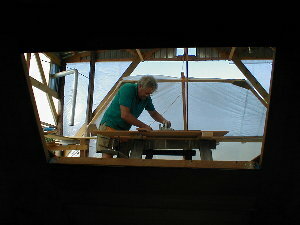 Meanwhile, Jim continues the job of deck box construction. 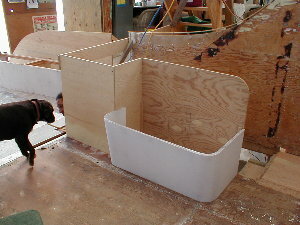 Below he’s shown gluing in the supports for the lid. 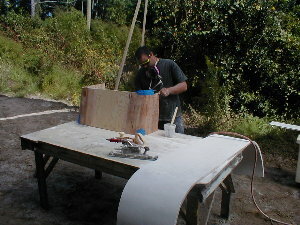 Stuart is busy epoxying, glassing, faring, and painting all wooden pieces that come his way. 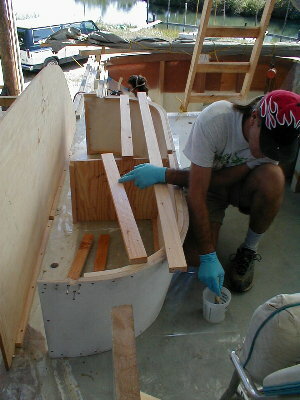 This week he worked on sections of the aft guest shower the shower seat, and benches. 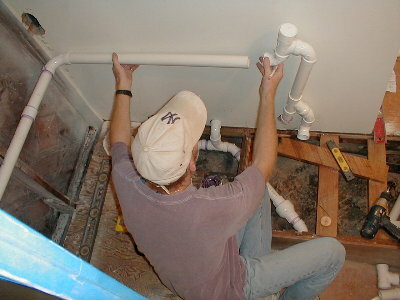 Tom is installing the vented loop for aft guest head, part of the Head Hunter toilet system. 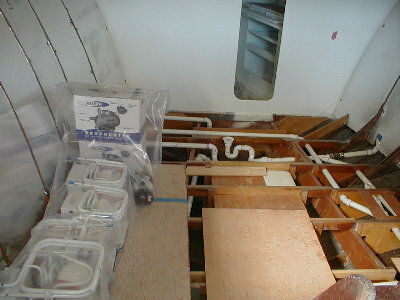 Earlier, he completed all the waste plumbing in the forward end of the boat. 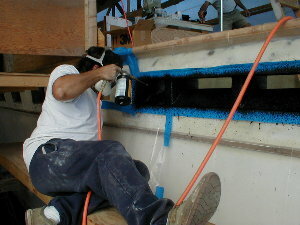 Bud is applying sound-deadening body schutz, an oddly-named black rubber-based compound, to the air intakes of the engine room. This will reduce engine noise considerably. Good thing the boat has come down with body schutz, and not the crew! 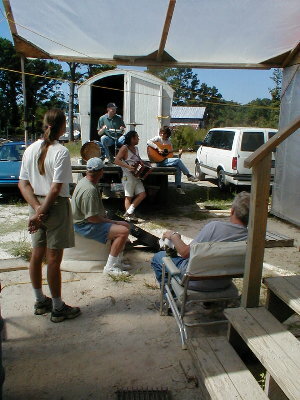 Jeanette and Norm attached fiberglass insulation to lead-shield sound proofing board, and placed it in the equipment room, a hidden area under the galley that FishDoc never knew existed until today. The room will contain the air conditioner compressors, the potable water pumps, the water maker, a bank of batteries, an inverter, and other associated equipment. 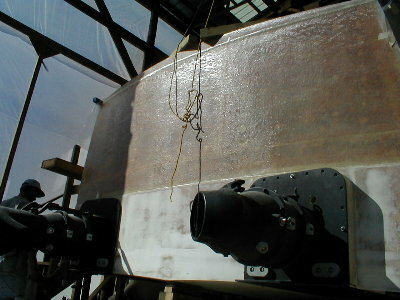 Side vents will direct heat outside, and the insulation will prevent heat and noise from entering the forward stateroom and galley.